In civilised society the rising "crime rate" is a thing of terror. Clever governments manipulate it, the public messianically fear it, and the social scientists misunderstand it. In the face of such confusion Emile Durkheim reminds us that without a crime rate society is utterly impossible; it cannot constitute itself, maintain its solidarity, or develop morally. In short, we cannot live with or without a crime rate. This dissertation is an exegetical work, and attempts to unpack the Criminology of Emile Durkheim. It is divided into six chapters, five of which are expository, the sixth critical. It begins with a look - in overview - at Durkheim`s philosophy and how it underpins his theories of crime and punishment (chap.1). By their nature theories of crime and punishment (chap.2) presuppose the more primary theoretical formulations both of evolution and society (chap.3), the one answering the theoretical time requirement, the other the spatial requirement, and each symbiotically related to the other in an integral theory of social evolution. Durkheim`s treatment of the modern State (and the Conscience Collective) as an organ of social control (chap.4), is of primary importance, not least because it underpins his treatment of the broader issues, such as the connection between civil and criminal law, morality, and authority (chap. 5). Since there is hardly a serious Durkheimian proposition that is reducible to a provable or an uncontentious fact (chap. 6), it can hardly surprise us that, on the one hand, he attracted such copious criticism and, on the other, has remained, perhaps the most popular sociologist of the twentieth and twenty first centuries. 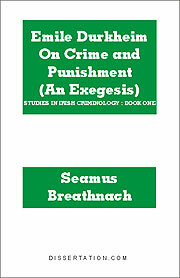 Seamus Breathnach, author of The Irish Police (from earliest times...) has been a lecturer of Postgraduate Criminology at VEC/DIT (Dublin Institute of Technology), Rathmines, Dublin, for the past twenty years.